A second look — that’s what the Gaillardia Country Club in Oklahoma City is getting these days thanks to their new DaVinci Roofscapes composite slate roof overhead. We shared this beautiful re-roofing project last summer on our DaVinci blog. But, since we just got new pictures of this designer roof we decided you deserved to get a second look too! So, rather than reading lots of words … focus on the pictures. 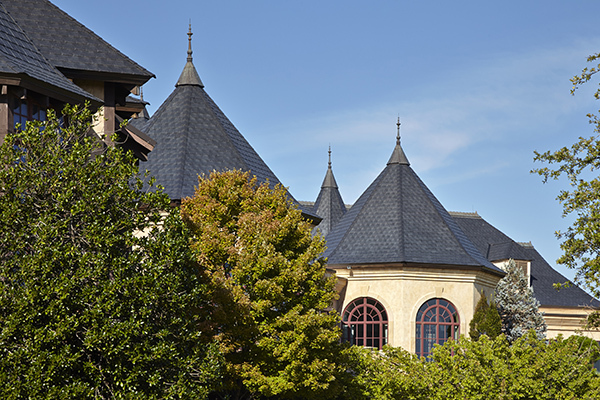 You’ll see the French Normandy design style of the 55,000-square foot Gaillardia Country Club now boasts Bellaforté Slate Black polymer roofing on the multiple turrets and roofing structure areas. With the appearance and beauty of natural slate roof tiles, Bellaforté provides a “better than nature” sustainable roofing alternative backed by a 50 year roof warranty! P.S. – Want the full story on this fake slate luxury roof? See Impact-Resistant DaVinci Roof Selected for Oklahoma City Country Club.